I attended the Internet of Everything for real 2014 event in Stockholm, Sweden. Representing Evothings AB, a Swedish startup focusing on providing simple easy-to-use mobile application development tools specifically for the IoT industry. 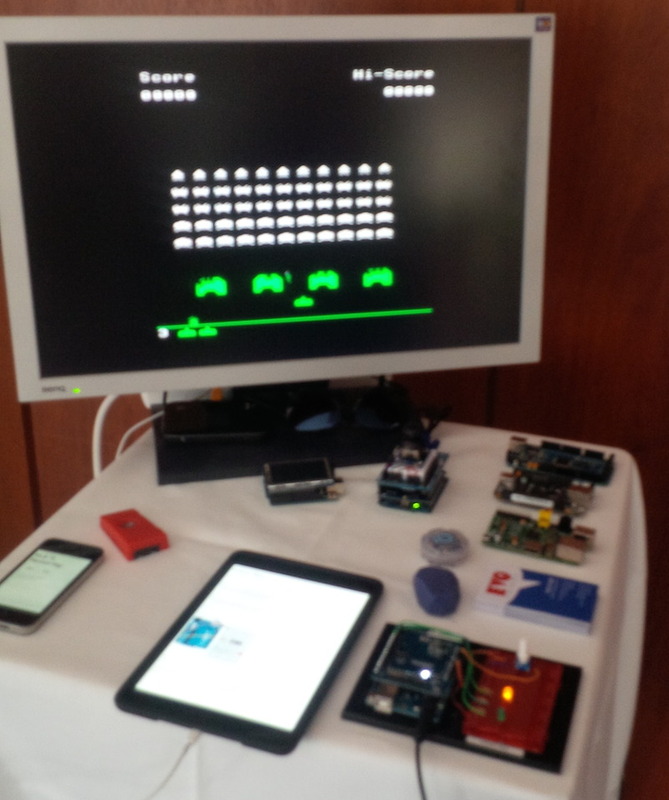 In our booth we showcased some cool low level embedded systems like the arduino, Raspberry pi and Beagle Bone boards in addition to a few of the configurations that we have put together for demo purposes (the Space Invaders and Frogger game arduino setup was bait to get visitors). A key element of our booth was to demonstrate the interaction between iOS and android devices with some of the sensor and custom hardware using BLE (low energy Bluetooth) and the simplicity of the Evothings studio for writing hybrid HTML5 / native software to display IoT related information. Our demos were able to communicate effortlessly with a Texas Instruments sensor tag and our custom LED / variable resistor arduino board we assembled. With most of the major players making land grabs within specific segments of the IoT industry (sensor, collection, storage, analytics) it was surprisingly positive to see the reaction of how Evothings, a Stockholm based startup, is focusing on presentation of data and end-user interaction with IoT components and making it easy for developers to build applications supporting multiple devices and removing fragmentation concerns. In addition to our efforts there was a number of high profile speakers from the likes of Cisco, Tele2, Microsoft in addition to a number of startups that demonstrated what they were doing within the IoE field - many inspirational concepts that simply confirm that this industry is moving quickly and becoming a important one in the years to come.